Avocado toast is a daily thing in our home. Lately, since I’ve been sleeping in a bit (baby Roen still feeds a few times during the night), my hubby Darren is the one who wakes up first, makes coffee and puts together said avocado toast. We both like our toast piled high with tons of avocado. As a way to make the avocado go further, Darren came up with the clever idea of lightening up the dish by blending tofu into the avocado. But of course, tofu doesn’t taste like much. To re-inject some flavour, we’ve been adding Hellmann’s Vegan into the avocado–y mixture. 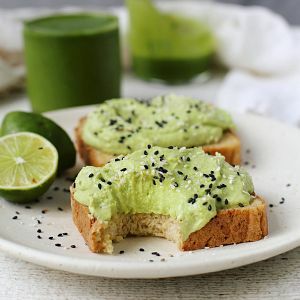 With a sprinkle of sesame seeds or even just coarse sea salt and lime on top, this version of avocado toast is totally to die for and sooooo satisfying to sink your teeth into!! Hope you enjoy it as much as we do. Add avocado, tofu and Hellmann’s Vegan to a container and, using a handheld blender, puree until smooth. If you have a blender with a small enough container, that can work, too. 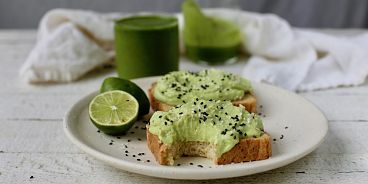 Load your whipped avocado mixture onto pieces of toast and finish with a squeeze of lime, salt and sesame seeds.